Torsion Springs are close-coiled helical springs designed to resist twist or rotation forces from two directions. A torsion spring consists of a body of coils and two legs attached to other components. When the ends rotate around the center of the spring, the spring tries to push them back to their original position. The body coils are close-wound with minimal tension between the coils. You can design a torsion spring with open-wound coils to reduce friction or when the spring needs to perform as a torsion or compression spring. Most torsion springs are made of round wire with straight legs. Optimum Spring manufactures custom torsion springs in different lengths and degrees of tension to suit your specifications. To help you solve basic torsion spring design challenges, please visit our Torsion Spring Design Alternatives Guide. Follow Optimum Spring Manufacturing's board Torsion Springs on Pinterest. Special considerations should be given when choosing a leg configuration for your torsion spring. The recommended allowable hook stress in torsion is 30-45% of its minimal tensile strength depending on material, while that for bending is 75% of its minimal tensile strength. Torsion spring legs that are straight or parallel on the same side are considered to have a 0º leg angle. The increasing angle is in the unwinding direction. When the ends rotate around the center of the spring, the spring tries to push them back to their original position. Dd (Shaft): Maximum diameter of a spring shaft in industrial applications. Torsion springs are usually mounted over a shaft, mandrel, or arbor. Di (Internal/Inside Diameter): Calculated by subtracting two times the wire diameter from the external diameter of a spring. Internal diameter in torsion springs decreases while the spring is working even up to shaft diameter. L0 (Free Length): Overall length of a spring in unloaded position. Free Length decrease while spring is working. Ls (Leg Length): Distance from the center axis of the coil body to the end of a leg of a torsion spring. Torsion spring end style is straight legs. Number of coils: Total number of coils in a spring. An (Maximum Angle): Maximum acceptable rotation angle for the spring in degrees. 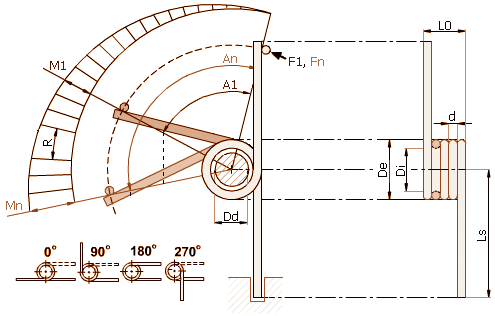 Fn (Maximum Force): Maximum acceptable force that can operate at the end of a leg of a torsion spring. Mn (Maximum Torque): Maximum acceptable torque in lb*in or Newton*mm. R (Spring Rate/Stiffness): Angular return torque provided per unit of angular displacement in pounds per inch (lb/in) or Newtons per millimeter (N/mm). Leg positions: 0, 90,180 or 270 degrees. Helix Direction: Right or left-handed. A left-handed spring loads in a clockwise direction. Since force is applied to torque and not deflection, right and left can not be interchanged. Round wire is most commonly used for torsion springs because it is most adaptable to standard coiler tooling. We can manufacture torsion springs with square, rectangular and special wire sections. Formulas for torque are in inch pounds. When a force is specified at a distance from the centerline, the torque, is called the moment, is equal to the force multiplied by the distance. Rate calculations for torsion springs must consider friction between adjacent coils as well as friction between the torsion spring body and the arbor over which it revolves. Dimensional Limits: Torsion springs are mounted over a rod or shaft. Suggested shaft diameter should leave 10% clearance within the inside diameter of the torsion spring for deflections. For greater deflections, reduce the shaft size. As torsion spring assumes a load and the body length enlarges, the body diameter will reduce. Take this into account when design space is limited. We offer fast turnaround on small, medium and large runs. In addition, we welcome any custom torsion spring projects which require limited quantities. Our design specialists offer you specific advice and design review during the prototyping process. Our torsion springs go into many applications for diverse industries that require high-quality coil springs. See a list of Industries we serve. Our coil spring manufacturing capabilities enable us to produce the following torsion spring types: straight, straight offset, hinged torsion springs, short hook end and custom torsion springs. Music wire, oil tempered, stainless steel, nickel alloys and copper alloys are the most commonly used materials. Many other materials are available upon request.